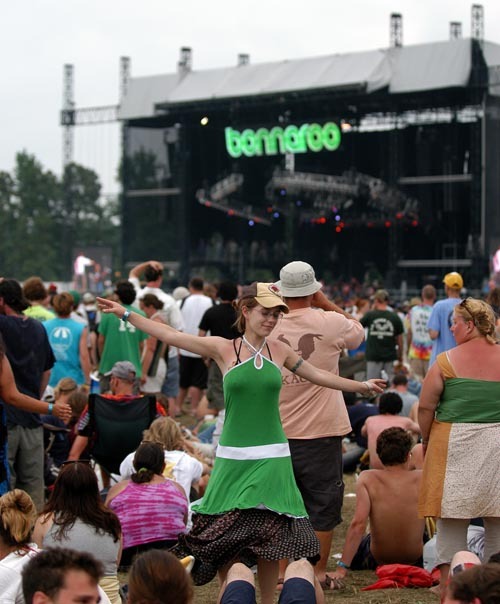 The Bonnaroo Music and Arts Festival (Bonnaroo, Rooville, BonRoo, Broo, roo or the ‘Roo for short) is a four day annual music festival by Superfly Productions and AC Entertainment, first held in 2002. The festival is held on a 700 acre (2.4 km²) farm in Manchester, Tennessee, 60 miles southeast of Nashville, Tennessee. The main attractions of the festival are the multiple stages of live music, featuring mostly jam bands, but also including hip hop, jazz, americana, bluegrass, country music, folk, gospel, reggae, electronica, and other alternative music. The festival features craftsmen and artisans selling unique products, food and drink vendors, and many other activities put on various sponsors. On January 10, 2007, Bonnaroo organizers Superfly Productions and AC Entertainment purchased a major portion of the site where the annual music festival is held. The purchase of 530 acres encompassed all of the performance areas and much of the camping and parking area used for the annual festival; the festival will continue to lease another 250 acres that currently serve as additional parking and camping. Tennessee Law Enforcement Officers across the state are well aware that a large number of out of state visitors make the trek to Manchester for this annual event. Unfortunately, law enforcement in some parts of the state tend to be a bit more “aggressive” with these out of state visitors than they might normally. They often believe that Bonnaroo concert goers carry a multitude of illegal substances with them when they visit the show. There are several things concert goers should remember should they be pulled over by one of these law enforcement officers. If you refuse to give an officer consent to search your vehicle, then only in very limited circumstances do they have the right to do so. Further, if you did give consent; the consent given must be unequivocally, specifically, intelligently, and must be uncontaminated by duress or coercion. State v. Brown, 836 S.W.2d 530, 547 (Tenn. 1992) Moreover, even if the consent is voluntary, evidence seized in the search will not be admissible if the search exceeds the scope of the consent given.. State v. Troxell, S.W. 3d 866, 871 (Tenn 2000) For example, what parts or items in the vehicle did the police have consent to search? The police may tell you things such as “The drug dogs are on their way so you might as well just give me what you have” or “If you give me what you have right now, then I will just issue you a citation” or “I can search anyway- that is the law in Tennessee so you might as well let me.” Do not believe them, this is not the law in Tennessee or any other state. You always have a right to say no. As I said before, Law enforcement can only detain you as long as necessary to complete the purpose of the traffic stop. For example, if you were pulled over for speeding; you can only be detained as long as it takes to issue a citation. The police may not detain you any longer than that. You may politely explain to the policeman that you are in a hurry and if they are through issuing the citation, you would like to leave. THEY MAY TELL YOU UNDER TENNESSEE LAW YOU HAVE TO STAY UNTIL DRUG DOGS ARRIVE – THIS IS NOT TRUE!! IF THE POLICE HOLD YOU LONGER THAN NECESSARY, ALL EVIDENCE THEY SEIZE AFTER THAT MAY BE SUBJECT TO BEING SUPPRESSED IN COURT!! If you were held an unreasonable time while waiting for the drug dogs, or while the officers were trying to convince you to let them search- the search may have been illegal under Tennessee law. AT THE GATES AT BONNAROO, YOU STILL MAY REFUSE TO LET THEM SEARCH YOUR VEHICLE. They probably will search it anyway and say they have permission to search any vehicle coming onto the property. However if you refuse to give them consent, or give consent under duress- any evidence seized may be subject to suppression in court. Think about it, if I had a friend at my house and the police came and asked me to allow them to search- do I have the right to allow them to search my friend’s purse because she is on my property? Absolutely not. Also, if you sign a consent form under duress or threats from any officer, the search may not be valid. I have handled many cases involving people on their way to or on their return from Bonnaroo. Cops are out there looking for these folks and they are often targeted for unwarranted traffic stops and illegal searches. Please do not hesitate to contact our office should you have any questions regarding problems you encounter on your trip to Bonnaroo. Have fun, but be careful!